The Phone Directory is designed to replace the printed-on-dead-trees phone directories used in many corporate environments. Paper phone directories can be very expensive to produce and need to be updated frequently to be of any use. 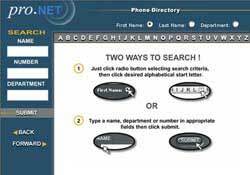 The Phone Directory on the other hand costs nothing to modify, it takes only moments to add, modify or delete an entry. We have been here for you since 1997. Over the last 10 years we have seen the highs and lows of the Internet industry, and have survived mainly because of adhering to the business fundamentals of offering feasible business solutions with a high level of customer satisfaction. Our team at pro.NET Communications is a small group of individuals that communicate and work effectively as a collective unit to deliver high end customer service. We maintain a small team at pro.NET Communications so that we can provide the level of service that our clients expect. We create relationships with our clients so they do not get lost in "the shuffle" that seems to happen so often in large companies and other Internet service providers. Everyone on our team is competent and involved in more than one facet of the business. This sharing of responsibilities provides for a more cohesive team that is required for great customer service.